How do we know what the capacities of the cremation ovens at Auschwitz-Birkenau were? There are no authentic Nazi documents that address the capacity of the crematoria ovens in Auschwitz-Birkenau. To make this claim, Holocaust deniers have to reject clear evidence. For instance, David Irving, who the High Court in London in 2000 declared to be a Holocaust denier, racist, and antisemite, asserts that an important letter summarizing ideal cremation capacity is a forgery. This document suggests that the oven at Auschwitz-Birkenau could cremate 4,756 bodies in a 24-hour period. There is an authentic letter from Karl Bischoff, the head of the Central Building Administration at Auschwitz-Birkenau, to Nazi engineer Hans Kammler. This letter clearly states the cremation capacity for Birkenau’s ovens in a 24-hour period. Bischoff arrived at his figures by assuming that each of the 52 muffles could cremate four bodies an hour, which by definition required multiple cremations at one time. By Zentralbauleitung Auschwitz, Töpf & Söhne [Public domain], via Wikimedia Commons. Is the Bischoff letter a forgery? David Irving argues that the Bischoff letter was forged by the Russians to embarrass the Germans. But the Russians’ own (incorrect) figures for the number of people murdered and cremated in Auschwitz-Birkenau were four times higher than the actual death toll. Why would the Russians forge a letter that confirmed less than one-fourth of their own calculations? 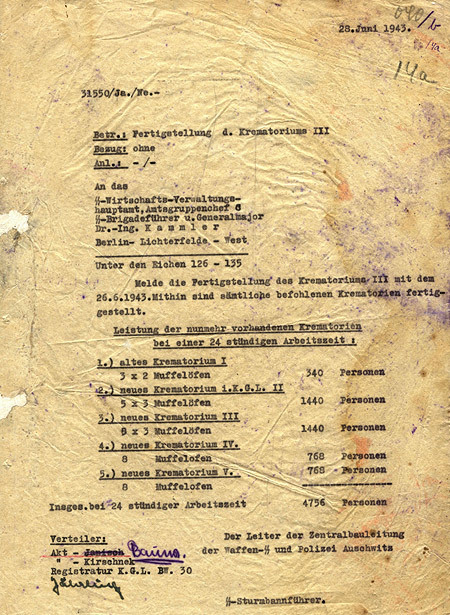 There is an authentic Nazi document on the capacity of the crematoria ovens at Auschwitz-Birkenau: the Bischoff letter. The letter clearly details the Nazis’ own calculations: the ovens had the ability to burn at least 4,756 bodies in a 24-hour period. Holocaust deniers assert that the letter is a forgery, but there are critical problems with this assumption. Transcript, Day 8, January 24, 2000, pp. 146-150. See here. Transcript, Day 32, March 15, 2000 at 27.22. and Robert Jan van Pelt, The Case for Auschwitz: Evidence from the Irving Trial (Indiana University Press, 2001), p. 344. The Russians, for purposes of propaganda against their vanquished enemy, claimed that 4,000,000 people had been murdered at Auschwitz-Birkenau. No mention is made of the Jews—they considered all those who had been murdered were the victims of German fascism. The real mortality figure is closer to 1,100,000, of which some 900,000 were Jews. For more information about Jewish Studies at Emory University, please visit the Emory University’s Tam Institute for Jewish Studies or contact us. Support the fight against Holocaust denial by donating through Emory University's Online Giving portal.